Since 1972, Guru Gobind Singh Study Circle is putting in its humble efforts as a non-political, academic, cultural and socio- religious organization for inculcation of moral and ethical values amongst the youth. 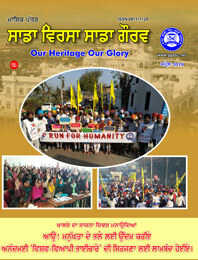 With its headquarters at Ludhiana, Punjab, India, Guru Gobind Singh Study Circle has emerged as an organization fully committed to the cause of future generations for bringing moral awakening as enshrined in Sri Guru Granth Sahib among the youth irrespective of their caste, religion and nationality. The Organization has already been recognized by the D.P.I. (Schools) and D.P.I. (Colleges) Punjab, to establish the Units of Guru Gobind Singh Study Circle in all the schools and colleges of the Punjab (Click to see copy). 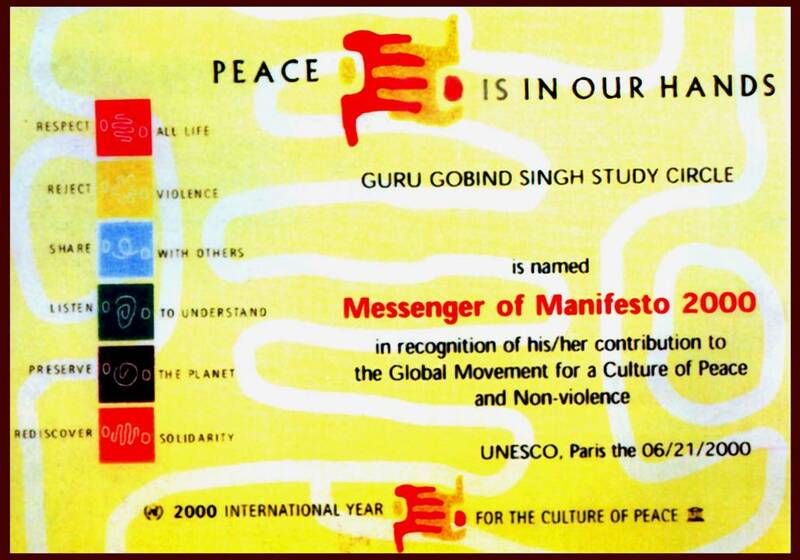 GGSSC is recognized as "Messenger of Peace" by UNESCO and this organization is also got certification of ISO 9001:2000 from UKAS. To create awareness about our rich and glorious heritage. To remove social and other evils from society. To launch a movement in the fields of Literature, Culture, Social Service, Education and other aspects, as per universal approach of Gurbani. To educate people about the ill designs of unholy and untruthful individuals, create respect dedication & faith in Sri Guru Granth Sahib. To restructure and transform the society into casteless social system. To encourage non-professional recitation of Gurbani and Kirtan. Education is the basic modus operandi & natural working of Guru Gobind Singh Study Circle . 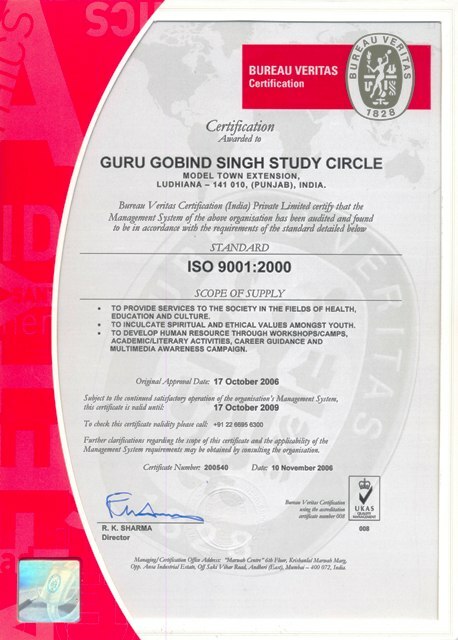 It is on high priority of Guru Gobind Singh Study Circle to acquire and adopt the hi-tech techniques for knowledge of Gurmat. Every volunteer shares the knowledge with others for one's spiritual and moral progress according to Gurmat approach and endeavours to contribute effectively for the development of a novel society. There are various methods to establish relationship of message such as Seminars, Conferences, Panel Discussions, Contests, Personality Development Camps, Audio-Video method, Group Discussions and personal contacts etc. The workers of Guru Gobind Singh Study Circle have created a distinctive history for voluntary services during 42 years of it's establishment. The works of approximately 50 projects/wing/organization are running with great enthusiasm under the administrative control of its HQ at Ludhiana , Punjab . The activities of Guru Gobind Singh Study Circle is divided into 5 councils and 54 zones. This organization is working in 17 States & 11 Countries.